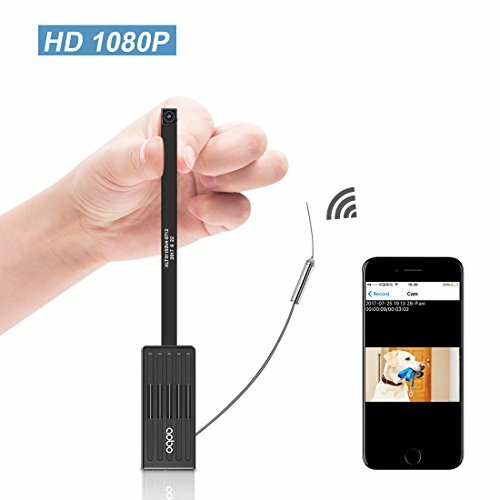 ◆ 1080P High Definition: This is a 1920x1080 mini hidden camera,allows you to view and monitor your house and office in true high definition without loss of details. ◆ Small Size: This AOBO wireless spy camera is the world's smallest camera.The lens is as small as the clothes buttons, easy to hide, it fit for all kinds of portable tools. ◆ Motion Detection and Alarms: When motion is detected, this hidden wifi camera will takes a picture and pushes a message to your phone,and you can also set Motion detection sensitivity,Alarm Schedule,Warning Tone,Alarm interval,Push Notifications etc,this mini wifi ip camera will faithfully record your uninvited guest's action in real-time. ◆ Takes Photos&Videos: When the nanny camera without a memory card, you can take pictures and record videos in the video window, and save it in your phone.So you don't miss any important image. ◆ Supports 128G Card: This wireless wifi camera supports 128GB micro TF Card in Max (Not included). You can also set the camera's SD card record mode, Such as Record time,Resolution,The time saved for video files to the SD card,Record sound,Loop recording.